Post title heroically avoiding a pun on 'Tutu'. 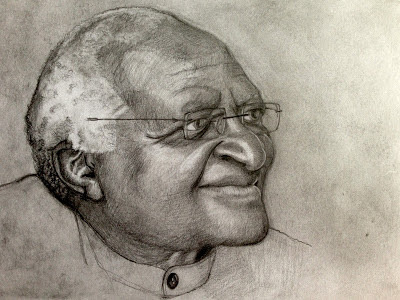 Here is a drawing of Archbishop Desmond Tutu. You may ask: why draw Archbishop Desmond Tutu? But if I may turn that question round… why not draw Archbishop Desmond Tutu? You see? Suddenly all your not-drawing-Archbishop-Desmond-Tutu life choices are looking a bit shaky, aren't they? P.S. Good news - the Legal Aid petition linked to in the last post has now passed 100,000 signatures, which means (we are told) that the issue will be considered for debate in the House of Commons. Thank you to anyone who signed it after coming here.